Feb 1 Cauliflower Peppercorn "Steaks"
Cauliflower is making a comeback especially in our house! These Peppercorn Steaks happens to be one of my favorite Vegetarian Dishes. I have promised the recipe for the last few months so here it is! Hope you guys love it as much as we do! 1 large baking potatoes sliced matchstick, tossed in olive oil and baked at 425 till crispy (for about 30 min). First Prepare your cauliflower and start by preheating the oven to 425. Slice the cauliflower into 3-4 “steaks” about 1 inch thick. You want to cut through the core in order for it to stay in together. This can be really tricky. First cut the cauliflower in half with the base down (the non round side). Then work your way back out and try to get at least two steaks per half. The rest of the cauliflower I cut up and roast with the steaks so keep and do not waste. Next, lay the steaks on a greased cookie sheet (you can use olive oil or baking spray) and also add on the pieces that crumbled. 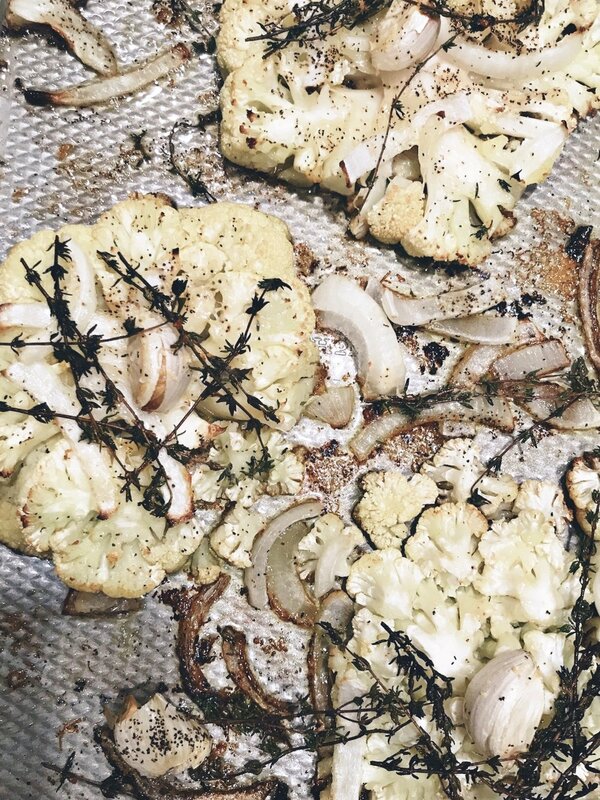 Drizzle the olive oil evenly over the cauliflower. 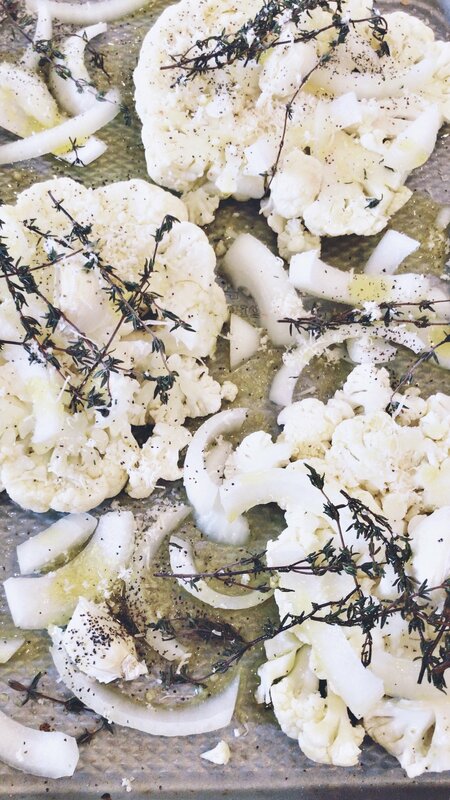 Tuck in the garlic and thyme sprigs over the cauliflower and salt and pepper. Sprinkle on half the cheese. Bake for about 30 minutes then add on the rest of the parmesan cheese. Bake for an additional 10 more min and start to prepare your sauce (the sauce takes 10 min so I start it after I add the cheese). In a small saucepan, add olive oil to a pan and on medium heat add in the thinly sliced shallot and minced garlic, saute until brown about 3-5 min. Next, add the peppercorns and saute an additional 1-2 min until fragrant. Add in the beef broth and bring to a boil and reduce for about 3-5 min. Last, add in the sour cream and whisk together for 2 min until mixed in. Plate the steaks and spoon over desired amount of sauce. If you like a lot of sauce you can always double the recipe. Serve with baked fries.